Pneumonia, which is often called community acquired pneumonia or bronchopneumonia, is a serious lung condition where the lungs fill with fluid and create severe difficulty breathing. Pneumonia is the inflammation of the lung typically caused by an infection. Pneumonia can be caused by bacteria, fungus, or a virus. Pneumonia affects millions of people every year and is considered a common illness. The overall severity of pneumonia depends on the case, the age and overall health condition of the patient, as well as other contributing factors such as the onset of treatment. Pneumonia can be mild, severe, or fatal. Symptoms of pneumonia can often mimic other respiratory ailments such as bronchitis or even severe asthma. However, pneumonia will tend to worsen without treatment. The patient will experience symptoms such as fever, shaking chills, coughing up mucous that is either green, yellow, or bloody, sharp or stabbing chest pain, chest pain that is worsened by breathing deeply or by coughing, fast and shallow breathing, and shortness of breath or the feeling of pressure and tightness in the chest. Bacterial based pneumonia is the most common form in adults, and unfortunately is also the most serious. Pneumococcus is typically the cause of this form of bacteria, and can be stubborn and resistant to treatment. In children, particularly between the ages of two and three years old, respiratory viruses are the most common cause of pneumonia. In people with compromised immune systems, malnutrition, the elderly, and some people without explanation, the common cold or influenza can lead to pneumonia. It is not uncommon for patients who are hospitalized for various conditions to contract pneumonia while in the hospital for treatment. Hospitals are in fact filled with viruses, air born bacteria, and even fungal infections that adhere to clothing, bedding, toys, or other shared material of the hospital. While anyone can contract pneumonia, risk factors include a compromised immune system, age, being resistant to antibiotics due to over saturation, poor overall health, and malnutrition. There are various forms of pneumonia, and sometimes environmental factors can lead to pneumonia or place people at risk for pneumonia. A physician may to any number of tests if pneumonia is considered to be a possibility. Chest x-rays, a Gram stain or sputum culture, CBC to check the white blood cell count, arterial blood gases to check on the oxygenation level of the blood, CAT scan of the chest, or a pleural fluid culture if there seems to be fluid surrounding the protective lining around the lungs. Tests can confirm pneumonia, although typically a physician can diagnose pneumonia simply by the list of complaints the patient presents with. Complications from untreated pneumonia tend to lead to serious illness and often death. Pneumonia is a very serious illness and leaving it untreated allows the infection to worsen. While a healthy body may be able to fight off the infection over time, the chances of doing so are not worth the risk of the consequences. Treatment of pneumonia depends almost entirely on what type of pneumonia the patient has been diagnosed with. If the cause is viral in nature, antibiotics will not be effective although if the cause is bacteria, antibiotics will of course be the preferred round of treatment. Often pneumonia that can be treated with antibiotics, heavy dosing is often required either through an I.V or even a catheter that goes directly in the artery that leads to the heart. 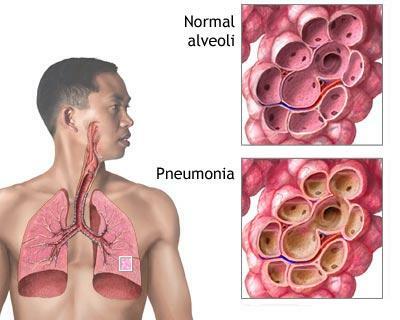 Some forms of pneumonia can be treated at home with ample rest, fluids to help break up the secretions and cough up the sputum, and controlling the fever with a fever reducing medication. Never give aspirin to children as a fever reducer or pain reliever when they may have a viral infection. This may lead to Reye’s syndrome. Oxygen therapy may be necessary for those who have an underlying respiratory condition or who are having great difficulty breathing. It is imperative to follow physician instructions and to rest as often as needed. Pneumonia is a serious illness and needs to be respected. A physician should be contacted if symptoms worsen after treatment has begun or if the patient shows no sign of getting better after three to four days. With proper treatment, most patients improve within fourteen days. Augmentin is a penicillin antibiotic that contains a amalgamation of clavulanate potassium and amoxicillin. On one hand, amoxicillin is an antibiotic in a family of drugs called penicillins. It mostly fights bacteria in the body in order to treat bacterial infections and the like. On the other hand, clavulanate potassium is a form of clavulanic acid that is similar to penicillin. Clavulanate potassium treats bacterial infections that are frequently resilient to penicillins and other antibiotics. Bactrim is a combination antibiotic which is generically prescribed as sulfamethoxazole and trimethoprim. Bactrim is also commonly prescribed as Bethaprim, Cotrim, Septa, Sulfatrim, and Uroplus, each with a pediatric version as well. Bactrim is typically used in the treatment of bacterial infections such as bronchitis, urinary tract infections, traveler’s diarrhea, ear infections, or Pneumocystis carinii pneumonia. Biaxin can be generically prescribed as clarithromycin, and is commonly used to treat bacterial infections which affect the skin and respiratory system. It can also be used to treat a specific type of stomach ulcer caused by Helicobacter pylori, provided it is used in combination with other medications. Biaxin is a macrolide antibiotic. Also generically prescribed as cefaclor, Ceclor is typically used to a treat a variety of bacterial infections, including but not limited to urinary tract infections, ear infection, skin infections, tooth infections, tonsillitis, and bronchitis. Ceclor is a cephalosporin antibiotic. Vantin, which can be generically prescribed as cefpodoxime, is commonly used to treat bacterial infections in the body. Vantin is a member of the family of antibiotics known as cephalosporins. Vantin is ineffective on infections caused by fungi or viruses. While not restricted to common uses, the common uses included using Vantin to fight ear infections, skin infections, pneumonia, sinus infections, tonsillitis, urinary tract infections, bronchitis, and gonorrhea.